Skin glows with moisturizers from St. Tropez, Jergens and Dr Renaud! St. Tropez Gradual Tan Tinted Body Lotion - 200ml - $38 - a fragrant body moisturizer that delivers an instant hint of bronze that visually perfects and illuminates the skin, while gradually building a healthy streak-free sunkissed glow and hydrating for up to 48 hours. It's suitable for all skin tones and types, dries quick and best of all, has no stinky self-tan smell. If you aren't great with self-tanners (yes, I'm talking about me) then you'll especially appreciate the tint, not only does it add instant colour, it is also a good cheat for knowing where you already applied it so you don't end up with bare patches! Available at Hudson's Bay stores across Canada and online at www.thebay.com. 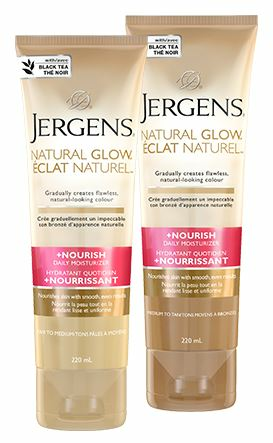 Jergens Natural Glow +Nourish Daily Moisturizer - 220ml - $12.99 - in two shades: Fair to Medium and Medium to Tan - that create a colour that's gradual, flawless and natural looking as it infuses your skin with a blend of effective moisturizers, antioxidants and Vitamin E. You'll experience natural-looking colour that's streak-free, hassle-free, and has no sunless tanner odour. Laboratoire Dr Renaud Liquid Sunshine All-Year Customized Self-Tanner - 15ml - $39.95 - gradually enhances face and body with adjustable colour that you get to control. When added to your usual cream, this clever self-tanner gives a natural “healthy”, personalized golden tan, without depriving you of the performance of your usual skin care - just 1 or 2 drops mixed with the cream of your choice adds gradual colour or evens, intensifies and extends your tan. Available at aestheticians across Canada - to find one near you visit ldrenaud.com/en/find-an-institute.